Mohammadi, S., Farhadi, F. (2016). Performance Evaluation of a Ranque-Hilsch Vortex Tube with Optimum Geometrical Dimensions. Iranian Journal of Chemistry and Chemical Engineering (IJCCE), 35(1), 95-107. Samira Mohammadi; Fatolah Farhadi. "Performance Evaluation of a Ranque-Hilsch Vortex Tube with Optimum Geometrical Dimensions". Iranian Journal of Chemistry and Chemical Engineering (IJCCE), 35, 1, 2016, 95-107. Mohammadi, S., Farhadi, F. (2016). 'Performance Evaluation of a Ranque-Hilsch Vortex Tube with Optimum Geometrical Dimensions', Iranian Journal of Chemistry and Chemical Engineering (IJCCE), 35(1), pp. 95-107. Mohammadi, S., Farhadi, F. Performance Evaluation of a Ranque-Hilsch Vortex Tube with Optimum Geometrical Dimensions. 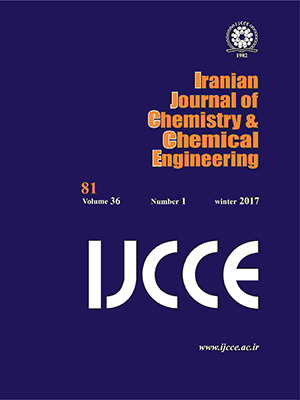 Iranian Journal of Chemistry and Chemical Engineering (IJCCE), 2016; 35(1): 95-107. A brass Vortex Tube (VT) with interchangeable parts is used to determine the optimum cold end orifice diameter, main tube length and diameter. Experiments were carried out to study the effects of operating pressure as well. It is shown that there is an optimum value for cold end orifice diameter, which is equal to 4mm and there is an optimum value for cold and hot exit temperature difference at CF=0.4.A 2-D Computational Fluid Dynamics (CFD) model is validated against the present experimental data. CFD code is applied to investigate the role of vortex tube diameter and length on the temperature separation. The code is also used to investigate and analyze the highly rotating flow field structure and its characteristic with respect to various cold fractions. Finally the results are extrapolated for investigating the effect of inlet pressures up to 1053kPa, VT on separation performances. Kurosaka M., Acoustic Streaming in Swirl Flow and the Ranque-Hlisch (Vortex Tube) Effect, J. Fluid Mech., 124: 139-172 (1982). Ahlborn B.K., Groves S., Secondary Flow in a Vortex Tube, Fluid Dyn. Res., 21: 73-86 (1997). Hilsch R., The Use of the Expansion of Gases in A Centrifugal Field as Cooling Process, Rev. Sci. Instrum., 18(2): 108-113 (1947). Ahlborn B.K., Gorden J.M., The Vortex Tube as A Classic Thermodynamic Refrigeration Cycle, J. Appl. Phys., 88 (6): 3645-3653 (2000). Gao C.M., Bosschart K.J., Zeegers J.C., de Waele A.T.A.M., Experimental Study on a Simple Ranque- Hilsch Vortex Tube, Cryogenics, 45: 173-183 (2005). Deissler R.G., Perlmutter M., Analysis of the Flow and Energy Separation in a Turbulent Vortex, Int. J. Heat Mass Transfer, 1: 173-191 (1960). Frohlingsdorf W., Unger H., Numerical Investigations of the Compressible Flow and Energy Separation in the Ranque-Hilsch Vortex Tube, Int. J. Heat Mass Transfer, 42: 415-422 (1999). Amitani, T. Adachi, T. Kato.A Study on Temperature Separation in a Large Vortex Tube, Transaction of JSME., 49: 877-884 (1983). Aljuwayhel N.F., Nellis G.F., Klein S.A Parametric and Internal Study of the Vortex Tube Using A CFD Model, Int. J. Refrigeration, 28 (3): 442-450 (2005). Eiamsa-ard S., Wongcharee K., Promvonge P., Experimental Investigation on Energy Separation in a Counter-Flow Ranque-Hilsch Vortex Tube: Effect of Cooling a Hot Tube,Int. Communications in Heat and Mass Transfer, 37: 156-162 (2010). Dincer K., Tasdemir, S. Baskaya S., Uysal B.Z., Modeling of the Effect of Length to Diameter Ratio and Nozzle Number on the Performance of Counter Flow Ranque-Hilsch Vortex Tube Using Artificial Neural Networks, Applied Thermal Engineering, 28: 2380-2390 (2008). Behera U., Paul P.J., Kasthurirengan S., Karunanithi R., Ram S.N., Dinesh K., Jacob S., CFD Analysis and Experimental Investigations Towards Optimizing the Parameters of Ranque-Hilsch Vortex Tube, J. Heat and Mass Transfer, 48, 1961-1973 (2005). Xue Y., Arjomandi M.R., Kelso R., A Critical Review of Temperature Separation in a Vortex Tube, Experimental Thermal and Fluid Science, 34: 1367-1374 (2010). Dutta, T. Sinhamahapatra K.P., Bandyopdhyay S.S., Comparison of Different Turbulence Models in Predicting the Temperature Separation in a Ranque–Hilsch Vortex Tube, Int. J. Refrigeration, 33: 783-793 (2010). Secchiaroli A., Ricci R., Montelpare S., D’Alessandro V., Numerical Simulation of Turbulent Flow in a Ranque–Hilsch Vortex Tube, International Journal of Heat and Mass Transfer, 52: 5496–5511 (2009). Aydın O., Baki M., An Experimental Study on the Design Parameters of a Counterflow Vortex Tube, Energy, 31: 2763–277 (2006). Nimbalkar S.U., Muller M.R., An Experimental Investigation of the Optimum Geometry for the Cold End Orifice of A Vortex Tube, Applied Thermal Engineering, 29: 509-514 (2009). Dincer K., Baskaya S., Uysal B.Z., Ucgul I., Experimental investigation of the Performance of A Ranque–Hilsch Vortex Tube with Regard to A Plug Located at the Hot Outlet, Int. J. Refrigeration, 32: 87-94 (2009). Kirmaci V., Exergy Analysis and Performance of A Counter Flow Ranque–Hilsch Vortex Tube Having Various Nozzle Numbers at Different Inlet Pressures of Oxygen and Air, Int. J. Refrigeration, 32: 1626-1633 (2009). Aydın O., Markal B., Avc M., A New Vortex Generator Geometry for A Counter-Flow Ranque-Hilsch Vortex Tube, Applied Thermal Engineering, 30: 2505-2511 (2010). Markal B., Aydın O., Avc M., An Experimental Study on the Effect of the Valve Angle of Counter-Flow Ranque–Hilsch Vortex Tubes on Thermal Energy Separation, Experimental Thermal and Fluid Science, 34: 966–971 (2010). Gao C., Experimental Study on the Ranque-Hilsch Vortex Tube, Technische Universiteit Eindhoven, (2005). Farouk T., Farouk B., Gutsol A., Simulation of Gas Species and Temperature Separation in the Counter-Flow Ranque-Hilsch Vortex Tube Using the Large Eddy Simulation Technique, International Journal of Heat and Mass Transfer, 52: 3320-3333 (2009) . Dutta T., Sinhamahapatra K.P., Bandyopadhyay S.S., Numerical Investigation of Gas Species and Energy Separation in the Ranque–Hilschvortex Tube Using Real Gas Model, International Journal of Refrigeration, 34(8): 2118-2128 (2011). Mohammadi S., Farhadi F., Experimental Analysis of A Ranque-Hilsch Vortex Tube for Optimizing Nozzle Numbers and Diameter, Applied Thermal Engineering, 61(2): 500-506 (2013). Fulton C.D., Ranque’s Tube, J American Society of Refrigerating Engineers, 58: 473-479 (1950).